Farmgirl Fare: Attention Homeless Heirloom Tomato Lovers: Would You Like To Move To A Farm? Attention Homeless Heirloom Tomato Lovers: Would You Like To Move To A Farm? This Could Be Your New Home Sweet Home! No, this charming little place isn't located here on my farm, because if it were you can be sure we'd be living in it instead of in The Shack. 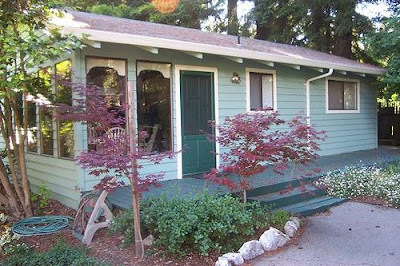 It's actually somewhere even better - on Love Apple Farm which is located in the Santa Cruz mountains near the central California coast. It's halfway between San Francisco and Monterey and about a half hour's drive to the beaches in Santa Cruz. My amazing foodie friend Cynthia Sandberg lives on and operates Love Apple Farm, a two-acre biodynamic paradise which originally became known for growing over 100 varieties of heirloom tomatoes each year. It is now the exclusive kitchen garden for world-renowned, two-Michelin-starred Manresa Restaurant in Los Gatos, California. There are also gardening events and classes held on the farm, and right now the 2008 Tomato Seedling Sale is going on. Fortunately for us faraway gardeners, Cynthia also somehow finds the time to tend a deliciously informative blog called Grow Better Veggies. Be sure to check out her fantastic (and free!) Grow Better Backyard Tomatoes Booklet. You'll find all the details about this wonderful cottage rental opportunity (along with why I'm telling you about it instead of moving in myself) over on my offshoot blog, In My Kitchen Garden. Oh, did I mention one of your new neighbors would be an enormous pot-bellied pig? © 2008 FarmgirlFare.com, the award-winning blog where the food is fabulous, the scenery is spectacular, and the animals are incredibly cute - but the words 'charming' and 'cottage' never seem to come to mind when people are attempting to describe The Shack. I just read her advice on growing better tomatoes. Even though my Wisconsin growing season is much shorter than hers in California, I learned several tips i can apply! Hi Susan. I was going to e-mail this to you, but I was having trouble with the e-mail, so I'll just have to make it public . . . You have mentioned a few times that you use your sheep manure to make tea for your garden. We have sheep now, and we have a big garden, so I'd like to know your method for making the tea. I couldn't find specifics for that on either of your websites. A Google search turned up a lot of unclear information, so I thought I'd just ask. Also, I saw in a couple of places that sheep manure can be considered too "hot," too much nitrogen I guess, so do you have plants that you try to avoid using it for, or have to dilute it for? Thanks! I have visited many times and enjoy your site quite a bit. I recently moved from Los Angeles to a rural farm in Washington state. And I have a hilarious donkey, Miracle as well as cows, goats, geese etc.. Now because of all your adorable sheep shots I'm looking into getting a rare heritage few lambs. Thanks for the exploits. I've felt a little disconnected since my move, but your posts help. Hope all's well at your farm! I just learned several tomato growing tips from Cynthia, too - and some of them I should even be able to implement with ease! For instance, I'd never heard of putting an aspirin tablet in the hole before you put in your tomato plant, but I'm certainly going to try it. Same goes for the eggshells - and we certainly have plenty of those. Sheep manure tea is wonderful stuff, and really easy to make. I'm hoping to answer all your questions about it tomorrow. But if for some reason I don't get back to you (who? me? ), feel free to email me: farmgirlfare AT gmail DOT com. Thanks!